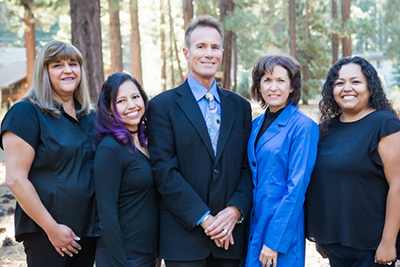 Dental Bridges – Tahoe Family Dentists - Providing excellence in dentistry in South Lake Tahoe. Bridgework can make your smile look natural and full again, and actually help prevent future tooth loss. If you are missing one or more teeth but the remaining teeth are healthy, a bridge may be the best option for you. 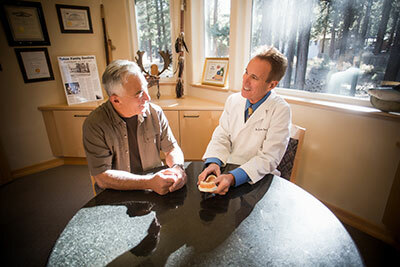 Our South Lake Tahoe dental office sees hundreds of patients every year who have lost a tooth or teeth, and need some way to stabilize their remaining teeth to restore form and function. A bridge does what its name suggests; it bridges the gap left between teeth when a tooth or teeth are lost. Your remaining, healthy, natural teeth on each side of the gap (called “abutment” teeth) will be fitted for crowns. A replacement tooth (called a “pontic”) is then created as part of the bridge, and attached to the crowns on either side. Bridges can be made of gold alloys, porcelain, or a combination of materials. The result is a functional arch of teeth with a replacement tooth that works just like the original did. Bridgework can make your smile look natural and full again, and actually help prevent future tooth loss. When a gap is created in the arch of teeth, the teeth on either side of the gap start to drift towards the empty spot, as will the opposing teeth, causing the collapse of the arch. Bone underneath the empty socket where the tooth used to be begins to dissolve, and the adjacent teeth may become loose. Before long, these teeth may also break or simply loosen and fall out, and the domino effects can continue. 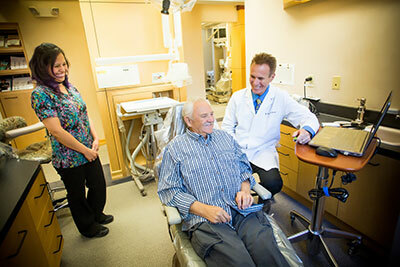 Bridge installation takes place over two appointments in our South Lake Tahoe dentist’s office. At your first appointment, the abutment teeth will be prepared to accept the bridge, and an impression will be made of that section of the mouth. A temporary generic bridge will be installed while the permanent bridge is being made. Your customized crowns, bridge, and pontic will be fabricated at the dental lab. Each piece will be carefully created to match the color and shape of your existing teeth as closely as possible. At the second appointment, the temporary bridge will be removed, and the permanent installation completed. Your chewing surface will be strong and stable and your smile natural and beautiful once more.